Hey guys! I'm back with another Pink Box review from Etude House. This one was actually a Valentine's Day themed box. I apologize for not posting it sooner. It's been hard juggling everything, my two jobs, my music and blogging, especially after my surgery. Anyways onto this lovely review. 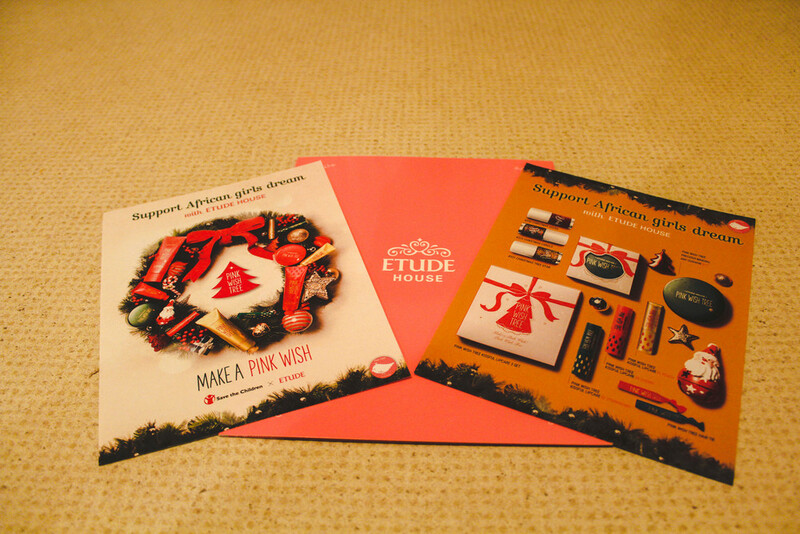 I love the themes that Etude House comes up with. This box's theme is Give Me Chocolate. Everything is chocolate themed. (Obviously, LOL!) There are three eye shadows and I was sent two out of the three shadows. There are six nail polishes in the set and I was sent three nail polishes. The first eye shadow is called Cherry Truffle. The case that it comes in is so cute! It looks like a little chocolate bar with pink candy coating in a case. The brown shadow is a mixture of a matte and shimmery color. I would say it's a milk chocolate color. It's not too light and yet not too dark. It's a perfect neutral color to blend with colors that pop. The pink shadow is a subtle coral pink and has a creamy matte texture. It pairs perfectly with the milk chocolate brown shadow. The second eye shadow is called Cacao Fudge. The brown shadow (just like the other one) has a shimmery matte texture. The big difference between this one and the other one is that this brown is much darker. It's more like a dark chocolate color. It's a great color to fill in the crease of your eyes or the outer corner of your eyes. The gold color is a shimmery glittery color. It's a great shadow to put over your lid or to use as a highlighting shadow to go right underneath your brow. There were nail polishes from this chocolate theme that were sent to me as well. Mint Chocolate Chip is this awesome mint green color with flecks of brown specks and glitter in it. It seriously looks like mint chocolate chip ice cream! Cherry Ganache looks like a German Chocolate color. It's this gorgeous maroon red color. Milk Cocoa looks the way that it sounds, it's a milk chocolate brown color. You know what's cool about all of these polishes? They SMELL like CHOCOLATE! Seriously! They smell so good! It's amazing! I love them! I was also sent Precious Mineral Any Cushion Foundation as well in the shade of Natural Beige W13. If you already don't know about this, it's a foundation in a cushion. It's very build able. You can get medium to almost full coverage with this makeup. I would recommend moisturizing your skin before hand though because this formula is somewhat thick and if your skin is dry it won't take to the foundation very well. It might cake up on your skin. I also will be wearing this now and not in the summer because for me, at least, it will be too heavy for the summer time. I was also sent a sample package of Face Blur which a primer that is meant to blur your imperfections whether it's pores or lines. So there you have it guys. This box was pretty great! It was so adorable! I was really excited when I saw what was in this box. Don't forget to check out Etude House at etudehouse.com They always have some awesome special going on so make sure to make an account with them so that you can find out about their offers first. Don't forget to follow them on Facebook, Twitter and Instagram. Their Youtube page is pretty awesome too. Hey guys. I'm back with another Pink Bird Review. This box was actually sent to me a little bit ago. I recently had sinus surgery and I'm finally starting to feel better. Thank goodness! This Pink Box was kind of like a Christmas/New Years Gift with a Thank You note in it. The first thing I noticed was the thank you note. It looks like the carriage from Cinderella and it's got 2015 Happy New Year on it. It's a pop up card. It's so cute. Of course Etude House always sends pamphlets with info about the products that were sent. This pamphlet has info about calendar and the cute card. After seeing the card, the next thing I noticed was the Etti Block Calendar. Etti is the official mascot (if you will) of Etude House. She's this cute little kitty cat. She's so cute perched on the top of the calendar. The calendar is like Lego blocks. You can stack them according to what days fall where during each month. You can also place a block on the date where your birthday should be, a day you might want to go shopping and so forth. It's super cute. I love little things like this. The other items that were sent to me in this box were the Arctic Aurora Colors Shadows. The next pamphlet has info about the lovely eye shadows. This first shade is called Igloo of Siberia (WH902) It is a very light shadow. It's a shimmery white color with a hint of pink in it. It's very light so I will most likely be using this shadow on my brow bone to highlight it and in the inner corners of my eyes. This next shade is called White Night of Arctic (BK801) It is a grey colored shadow. It looks a lot darker in the compact than it does on your skin. I was surprised. It's a light grey color. I would probably use this as a primary color on my eyelids. It's a pretty color. This next color is called Fruit Sorbets (OR205) This color is really pretty. This is the shadow that is matte (in my opinion) It has a nice creamy texture. It glides on so smooth! I love it. I think this is one of my favorite ones! The next one is called Tip of an Iceberg (GR705) This is a light blue/green shadow. I feel like if Elsa from Frozen was to choose one of these eye shadows she would choose this one. This one is shimmery like the majority of the shadows. I would probably use this in the inner corners of my eyes. The last shadow is named Dancing Aurora (PK006) Makes me think of Princess Aurora from Sleeping Beauty ^.^ This shadow, like the grey one, is darker in it's compact as opposed to on your skin. Even though it looks like a maroon color it's a actually a lighter pink shade. I'm so happy I get to add these eye shadows to my makeup collection. These five colors are some of the many colors Etude House has to offer from their Look at my Eye Shadow Collection. You can find colors WH902, OR205 & BK801 here and the colors PKoo6 & GR705 here. Thank you again to Etude House for sending me these lovely products to try and review. Make sure to check out all of the cute new products at www.etudehouse.com Right now if you sign up for a membership you'll get a 10% coupon for your first purchase and then a 15% coupon for your second purchase. Who doesn't love a coupon right? Make sure to follow Etude House on Facebook, Twitter, Instagram and Youtube. Hey guys! Merry Christmas! Happy New Year! I'm back with another Pink Box Review from Etude House! It's been super busy with all of the holidays and work on top of that, I haven't been able to do much on here and I apologize for that. Etude House is good for always surprising me with a Pink Box at my doorstep. This Pink Box Theme is Pink Wish Tree. This Pink Box is special not just because it's Christmas themed but because of what the products represent. For each Pink Wish item sold a portion of the product will go towards the School Me Campaign by Save The Children. For each item ₩100 will be donated. That's around $0.10 per item. I know it doesn't seem like a lot but it is. Imagine all those items being sold online and it stores. It really does add up. The money will go towards providing educational opportunities for girls in four different countries in Africa: Sierra Leone, Libreria, the Republic of Cote d'lvire, and Uganda. This campaign helps provide resources for girls who can't afford to be educated because of domestic duties, early marriage and poverty. This campaign hits home for me. My father is from Nigeria and I have lots of family there. They have been blessed enough to go to school but I know some kids don't have that opportunity. So this really hit home for me! I think this is a great campaign and I'm so happy to be apart of it. You can be too. And that's what's so awesome about it! This Pink Box has a lot of great items. The first two items are cute hair ties. Red and green Christmas themed. The next three items are scented lip balms. They look cute and smell amazing! The gold tube is peach scented. Smells like a peach cobbler. Lol! The red tube is cherry scented. I'm not a big fan of cherries unless they're in my drink. Lol! The last one is strawberry scented. This is probably my favorite one. It smells so good! These lip balms aren't very pigmented so they are great to wear when you just need some moisture on your lips or when you need your lips moisturized before you put some lipstick on. My lips feel nice! They look nice too don't you think?! A Precious Mineral Any Cushion! Yah! Lol! I was sent the W13 shade. The green compact. Just like the other precious mineral compacts, this comes with a sponge applicator and a mirror. The color seems a bit light at first but it blends nicely. It's the same formula as the other precious mineral any cushions it's just packaged differently for the sake of the Pink Wish Tree Campaign. The last three items from this Pink Box are some lovely Play Nail Polishes. One solid color and two festive glitter polishes. I painted my moms nails because I had no chip polish on my fingers at the time. There's the lovely Christmas red. There's also the festive green and red glitter polish. I like the long green glitter. It's different and fun. Everyone loves glitter and gold right?! These colors go great together. You can find these items and more online. You can find the Pink Wish Tree Precious Mineral Any Cushion here. You can find the Pink Wish Tree KissFull Lip Care Box here. There are more Pink Wish Tree items to buy online. You can find them here. Have you guys tried out these products? What do you think of the awesome campaign they're apart of? Let me know. Also there is a promotion going on right now at Etude's online shop. You get free shipping on baskets $50 or more. The facial masks are also 50% off. You also get a free gift when you buy something from January 2nd-January 18th.